The extreme mood swings that characterize bipolar disorder (BD) make it difficult for people with BD to function normally in our demanding economy. A severe depressive episode can cause people to take sick leave, and manic episodes can lead to sloppiness and disorganized thinking. Proper bipolar disorder treatment is, therefore, extremely important. 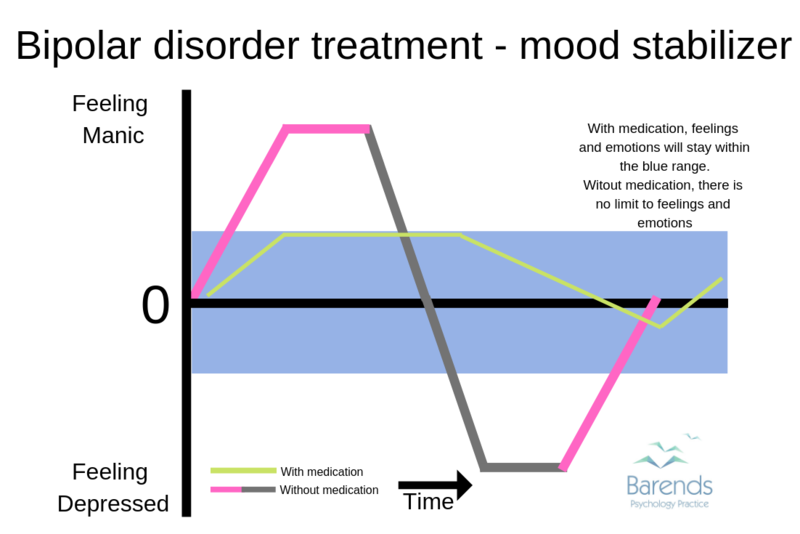 Bipolar disorder treatment focuses on relapse prevention, mood stabilisation, and reducing the duration and intensity of an episode. Unfortunately, not every treatment is effective, and the effectiveness of certain treatment types may be higher during a manic episode or during a depressive episode. For instance, medication has a stronger effect on manic episodes and psychotherapy has a stronger effect on depressive episodes . Before we focus on effective bipolar disorder treatment, we first identify the bipolar disorder causes and list the official diagnostic criteria for bipolar disorder. Bipolar disorder symptoms, risk factors and facts. Online treatment for bipolar disorder. At Barends Psychology Practice, bipolar disorder treatment is offered. Go to contact us to schedule a first, free of charge, session. (Depending on your health insurance, treatment may be reimbursed). There is more than one factor responsible for the development of bipolar disorder (BD), and for triggering its development. Researchers have found evidence suggesting that certain genes contribute to the development of BD, that drugs, medication or traumatic and stressful events can trigger its development, and that upbringing can affect the expression of bipolar disorder at one point in life. Meeting certain conditions, for instance having a parent with schizophrenia, does not mean that you will develop BD. It only means that there is a higher chance of developing BD. Of course, the more conditions you meet, the higher the chance that you may develop BD, but in the end it still remains just a chance and nothing more. In the chapters below, we’ll discuss evidence based bipolar disorder causes. There are several genes that all contribute a little bit to the development of bipolar disorder , and these genes can be inherited. With a heritability of 59%, there is a strong genetic risk factor of developing BD . The chance of developing BD increases 13.63-fold when a parent , or sibling has bipolar disorder or another mental disorder . Interestingly, men are as likely to develop bipolar disorder as women ; women usually are at more risk of developing mental disorders. What does heritability mean? Let’s assume that bipolar disorder consists of 100 parts. A heritability of 59% means that 59 of those 100 parts are explained through genetics. The other 41 parts cannot be explained through genetics; these parts can be explained through upbringing, and exposure to traumatic events . It is possible that someone inherits 30 or 40 or 3 parts that contribute to the development of bipolar disorder, but scientists do not know how much (if any) each person will inherit. In other words, the 59% does not say anything about the chance that one person will inherit bipolar disorder from a parent, and it does not say anything about how many parts of BD someone will inherit. A stressful or traumatic event can be very disruptive to someone’s circadian and social rhythm. These events typically require a lot of time and energy of a person. A stressful event may ask for a lot of organising and planning; a traumatic event may cause a person to experience a lot of flashbacks, nightmares, mood swings, and concentration problems. Both events significantly impact someone’s life. 16% of those with BD also have Posttraumatic stress disorder (PTSD) . Rhythm and structure help someone with bipolar disorder to function better in life. 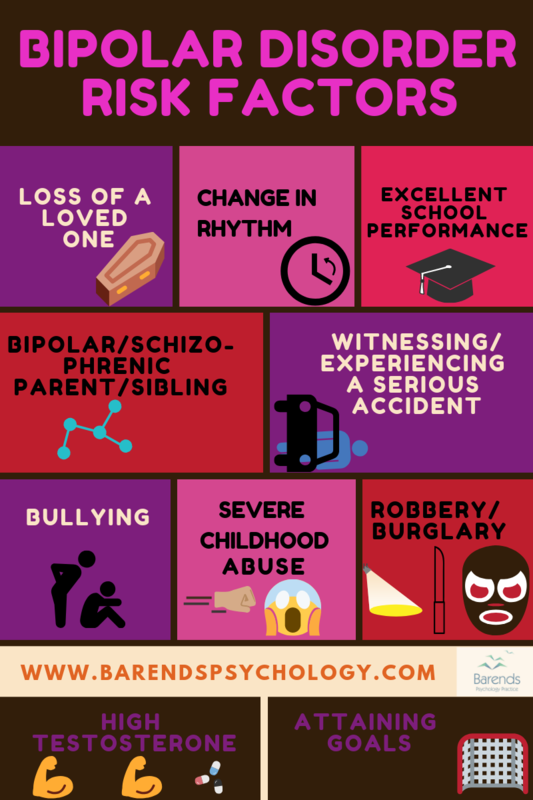 Experiencing a traumatic or stressful life event, however, such as moving away, losing a significant person, an accident, robbery or being bullied, increases the chance of developing bipolar disorder , because it disrupts someone’s rhythm. These events can cause someone to worry a lot or experience flashbacks, which in turn can cause sleeping problems. If someone loses a mother before the age of 5, it is more likely (4.05-fold) that someone develops bipolar disorder, and even at an earlier age . Losing a mother can have a huge negative impact on the emotional development of a child. Severe childhood abuse (sexual, emotional or physical) is another predictor of BD later in life. One in every two people with BD report severe childhood abuse, and they experienced their first BD episode at a younger age, compared to those who did not report severe childhood abuse . Also, severe childhood abuse is associated with more severe manic episodes . Sexual childhood abuse increases the likelihood of suicide attempts in adults with bipolar disorder . Examples of severe childhood abuse are being molested or raped, being neglected by parent(s), intentional physical force that results in harm for the child’s health, a repeated pattern of caregiver behaviour or extreme incidents that convey to children that they are worthless, unwanted, unloved, or flawed. Changing the social or circadian rhythm of someone increases the chance of developing bipolar disorder . The circadian rhythm, also known as sleep/wake cycle, is the 24-hour internal clock that regulates alertness and sleepiness on interval level. A change in these rhythms may affect someone’s hormone levels or the processing of emotions and feelings, which in turn can trigger the development of a manic or depressive episode. This suggests that sticking to a healthy day and night rhythm is very important for people with bipolar disorder. Negative social support from close ones can also trigger the development of a manic or depressive episode, and can even worsen the bipolar disorder symptoms during an episode . Guilt-inducing, intrusive, and critical statements are examples of negative social support. Staying calm when a close one experiences a depressive or manic episode can be quite challenging. (Advertisement, for more information about bipolar disorder causes, continue reading). In short: We do not believe that changes in social or circadian rhythm or negative social support alone are enough for someone to develop bipolar disorder. They could, however, contribute to its development, and even trigger its development. It is more likely that a combination of the above mentioned bipolar disorder causes: heritability, experiencing stressful and traumatic events, and receiving negative social support all contribute to the development of bipolar disorder. It is important to get a proper diagnosis when you are suffering from certain symptoms, because a proper diagnosis enables you to find the right treatment. 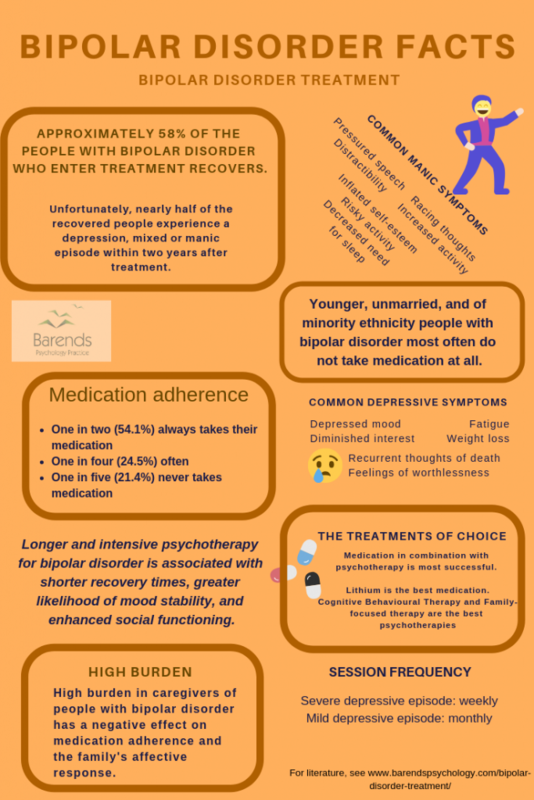 From the bipolar disorder treatment section below, for instance, it is clear that antidepressants are not effective in the treatment of bipolar disorder (BD), despite the fact that bipolar disorder comes with depressive episodes. If, somehow, someone wrongly receives the diagnosis of depression, then this people will not benefit from the antidepressants psychiatrists or doctors may prescribe. Next to receiving a bipolar disorder diagnosis, it is also interesting to know what triggered the development of BD or recurring episodes. If, for instance a traumatic event triggered a BD episode, it may be very beneficial to offer PTSD treatment. In some cases, (some) bipolar disorder symptoms become less severe or disappear entirely. If the situation at home is too stressful, focussing on problem solving and communication may be more effective compared to PTSD treatment, for instance. We’ll list the official DSM-5 bipolar disorder diagnosis and accompany most of the criteria with an example or explanation. If you want to know whether you have bipolar disorder, please take the test now. Characterized by the occurrence of 1 or more manic or mixed episodes (the manic episode may have been preceded by and may be followed by hypomanic or major depressive episodes, but these are not required for diagnosis). To meet this criterion: It is possible for someone to experience a manic episode without having experienced a depressive or hypomanic episode. It is also to experience a manic episode after of before a depressive or hypomanic episode. A hypomanic episode is similar to a manic episode, but less severe and lasts shorter. People still function during a hypomanic episode; during a manic episode this is not the case. Distinct period of abnormally and persistently elevated, expansive, or irritable mood, and increased goal-directed activity or energy lasting ≥1 week (any duration if hospitalized), present most of the day, nearly every day. This is the description of a manic episode. If you experienced this but only for a maximum of 6 days, then we consider this a hypomanic episode. Excess pleasurable or risky activity. Marked impairment not due to a substance or medical condition. Someone who experiences a manic episode due to medication, drugs, or brain damage, for instance, does not meet this criterion. Do not meet the criteria for a mixed episode. See below for the criteria of a mixed episode. Cause functional impairment, necessitate hospitalization, or there are psychotic features. In other words, the person cannot function normally, cannot perform daily tasks. Are not caused by somatic antidepressant therapy. Criteria are met both for a manic episode and for a major depressive episode during at least a 1-week period. Causes functional impairment, necessitates hospitalization, or there are psychotic features. Symptoms are not due to substance misuse, a general medical condition, or somatic antidepressant therapy. (Advertisement, for more information about bipolar disorder treatment or diagnosis, continue reading). Never had a full manic episode; at least 1 hypomanic episode and at least 1 major depressive episode. Remember: a hypomanic episode is similar to a manic episode but less severe and typically lasts 4-6 days (7 or more for a manic episode). Less severe: an individual is still functioning normally during a hypomanic episode. This is not the case during a manic episode. Distinct period of abnormally and persistently elevated, expansive, or irritable mood, and increased goal-directed activity or energy lasting ≥4 but <7 days, and clearly different from usual nondepressed mood, present most of the day, nearly every day. Please note the difference between a hypomanic and manic episode in duration. Episode is associated with an unequivocal change in functioning, uncharacteristic of person, and observable by others. During the major depressive episode, 5 or more of the following symptoms are present during the same 2-week period, and represent a change from previous functioning. This criterion focuses on depressive symptoms that came up during the same 2-week period. These symptoms must show a change in functioning/thinking/feeling compared to the period before. Recurrent thoughts of death (not just fear of dying), recurrent suicidal ideation with or without a specific plan. These depressive symptoms must cause functional impairment (e.g., social, occupational). Difficulty functioning at work, for instance. Are not better explained by substance misuse, medication side effects, or other psychiatric or somatic medical conditions. Prominent and persistent disturbance of mood characterized by elevated, expansive, or irritable mood with or without depressed mood which develops during substance intoxication or withdrawal, and the substance/medication is capable of producing disturbance of mood. (Advertisement, for more information about bipolar disorder diagnostic criteria, continue reading). Formerly known as bipolar disorder not otherwise specified (NOS). cyclothymia for less than 24 months. There are three ways to treat bipolar disorder: medication, psychotherapy, and a combination of medication and psychotherapy. Psychotherapy in combination with medication is the bipolar disorder treatment of choice in most of the countries worldwide . Psychotherapy is very popular among youth (41.7%) and adults (48.4%), reduces hospitalization rates, and prevents future relapses . Some of the people with bipolar disorder (BD) combine psychotropic medications, such as mood stabilizers and antidepressants (23.6% of the youth and 31.1% of the adult population) or a mood stabilizer and antipsychotic medication (24.7% of the youth and 22.6% of the adults) . In this chapter, the most popular bipolar disorder medications are being described (and their side effects), and the most effective psychotherapies for bipolar disorder. Although widely available, only half (54.1%) of the people with bipolar disorder take their medication as prescribed when it comes to bipolar disorder treatment (Lithium or anticonvulsant medication) . This means that almost one in every two people with BD does not take the prescribed medication on a regular basis. One in five (21.4%) individuals with bipolar disorder do not take medication at all. This is unfortunate, especially considering the fact that Lithium and anticonsulvant medications are effective in the reduction of bipolar disorder. An interesting question is why so many people have difficulty taking their medications. Research suggests that bipolar disorder is associated with poor memory and dysfunctional verbal learning ; severe cases of bipolar disorder perform worse on tasks associated with memory and verbal learning. This could explain why people with bipolar disorder have difficulty taking their medications. They simply forget to take their medication. There are several types of medication people with bipolar disorder use nowadays: mood stabilizers, antidepressants, antipsychotics, and anticonsulvants. We’ll discuss them here. Mood stabilizers increase the release of serotonin and decreases the norepinephrine release. This helps to stabilize the mood, preventing someone with bipolar disorder to experience extreme emotions (severe depression or a manic episode). Lithium is the most effective mood stabilizer in bipolar disorder treatment ,,. Lithium reduces the risk of suicide (by 50%), prevents relapses, increases the prefrontal cortical activity during cognitive control, and regulates the processing of emotions, comparable to the levels of healthy adults ,. Lithium is the most effective type of medication for long-term treatment ,. Side effects Lithium: Lithium is less often prescribed these days due to its side-effects. Most of the Lithium side-effects are temporary and will disappear in a while . One of the biggest side-effects is its toxicity. Less than 1% of the people that use Lithium die due to its toxicity. There are 3 toxicity patterns: acute, acute-on-chronic, and chronic, with the two latter being the most dangerous. With worsening toxicity, side-effect could be: vomiting, slurred speech, development of a gross tremor, confusion, and lethargy . NOTE: if you want to become pregnant and are using Lithium, please contact your doctor/GP. Some studies did not find negative side-effects in pregnant women and their (un)born child, whereas other studies found cardiotoxicity and Epstein’s anomaly in children born to women taking Lithium during pregnancy . Antipsychotics have a positive effect on people with bipolar disorder; antipsychotics increase the prefrontal cortical activity during cognitive control, and regulate the processing of emotions. People with bipolar disorder who use antipsychotics show the same results as healthy individuals who performed the same tasks . Nowadays, approximately 46% of the people with bipolar disorder use antipsychotics . Long-term effects for relapse prevention is less clear, but are more effective in the acute treatment of manic and mixed episodes , compared to anticonsulvants or Lithium. The antipsychotics aripiprazole (Abilify), olanzapine, quetiapine, and risperidone are effective in the prevention of depressive or manic/mixed relapses . We’ve listed the side effects of Abilify and Risperidone, as they are the most prescribed antipsychotic medications for the treatment and maintenance of bipolar disorder . (Advertisement, for more information about bipolar disorder treatment, continue reading). It is unclear whether Risperidone or Abilify are safe to use while being pregnant. Anticonsulvants, also known as anti-epileptic medication, work as a mood stabilizer. Anticonsulvants block sodium channels or enhance the functioning of GABA. As a result, glutamate release is being reduced. Divalproex and lamotrigine are the most used anticonsulvants in bipolar disorder treatment, but lamotrigine is not better than placebo (a non working medication dummy) . Divalproex, on the other hand, is effective in the long-term treatment of bipolar disorder . It is unclear why many psychiatrists still prescribe antidepressants to treat bipolar disorder. A possible reason could be that people used to treat unipolar disorder and bipolar disorder the same way. Nowadays, however, research shows that antidepressants are not superior to placebo (a not working pill pretending to be medication) in the treatment of bipolar disorder ,. This means that it is better to take nothing compared to taking antidepressants, because of the possible side-effects. In case you are using antidepressants in the treatment of bipolar disorder, please talk to your psychiatrist or doctor about their motivation to prescribe you antidepressants, and consider different medication, such as mood stabilisers or antipsychotics. Antidepressants may be effective in the treatment of acute bipolar disorder, but more research is needed to confirm these findings. It is unclear whether Fluoxetine (Prozac) or Setraline (Zoloft) are safe to use during pregnancy or breastfeeding. Bipolar disorder treatment focuses on dysfunctional behaviour of people with bipolar disorder, such as social interaction, lack of rhythm, and daily functioning. For instance, research shows that individuals with bipolar disorder perform worse on executive functioning and verbal memory , which affects their daily functioning significantly. Some psychotherapies, however, also focus on the family dynamics and family interactions, such as family-focused therapy. Other effective psychotherapies are Cognitive-behavioural therapy, interpersonal and social rhythm therapy, group psychoeducation, and systematic care management . In general, longer and intensive psychotherapy for bipolar disorder is associated with shorter recovery times, greater likelihood of mood stability, and enhanced social functioning . Also, psychotherapy works better on the depressive episodes compared to manic or hypomanic episodes, because psychotherapy is often ignored/rejected when one experiences a mania or hypomania . We’ll discuss each therapy briefly and highlight its strengths.
. Better adherence with medication, on the other hand, seem to have mediated on the effects of manic symptoms . Even if the patient is not ready to participate in treatment, family-focused therapy can markedly reduce the health risk behaviours and depressive and manic symptoms in the person with bipolar disorder, because caregivers learn how to cope with stress and how to express emotions . Also, feelings of depression in the caregivers reduce markedly. In other words, family-focused therapy is effective for both the caregivers and individual with bipolar disorder. It is the a very effective type of bipolar disorder treatment. Cognitive behavioural therapy (CBT) focuses on collaborative goal setting, cognitive restructuring for depression and mania, problem-solving techniques, and methods to enhance interpersonal communication. Also people with bipolar disorder are expected to self-monitor their own symptoms, sleep patterns, behavioural activation strategies, and stimulus control . Cognitive restructuring focuses on the pessimistic explanatory styles in the depressive episodes and on the overly optimistic explanatory styles during manic episodes . CBT can be done individually, groups, and online. Online and in groups is often more affordable compared to face-to-face treatment. CBT on bipolar disorder reduces the amount of medication intake in 4 out of 5 patients, and reduces the duration of the depressive episodes by 50% , amount of hospitalization days, improves social functioning, and improves medication adherence . In other words: CBT is an effective type of bipolar disorder treatment. Interpersonal and social rhythm therapy (ISRT) focuses on different aspects: (1) poor interpersonal functioning, mainly during a depressive episode, (2) distuptive sleep/wake cycles that can trigger a manic episode, (3) resolving key interpersonal problems regarding grief, role disputes, interpersonal conflicts or disputes, and to stabilise social rhythms . Similar to CBT, ISRT asks patients to keep track of their daily routines, sleep/wake cycles and important events that could affect these routines. ISRT is effective in delaying (depressive) recurrences while patients succeed in stabilizing social rhythms in the acute phase, and slighty reduces suicide attempts. Although ISRT is effective during the acute phace, ISRT is not more effective than clinical management during the recovery phase of bipolar disorder treatment . Group Psychoeducation (GPE) focuses on the development of relapse prevention plans, implementation of illness management strategies, medication adherence, and general information about bipolar disorder and sleep/wake cycles. Learning about the disorder will increase the chance that episodes are being recognized in the early stages, removes the stigma around bipolar disorder, and improves medication adherence . GPE is more effective than unstructured support groups in preventing recurrences: 67% of the people in the GPE group versus 90% of the people in the unstructered support group experienced recurrences within 2 years after treatment, were fewer days hospitalized, and maintained higher Lithium levels over a period of 2 years . Systemic care models focus on relapse prevention, medication adherence, and illness management in a structured setting while providing pharmacotherapy, regular telephone monitoring of mood symptoms, and structured life goals . In a 3 year period, people with bipolar disorder in the systemic care group had between 5.5 and 6.2 fewer weeks in affective episodes. 4.5 of these weeks could be attributed to a significant reduction of the manic episodes . Overall, quality of life, and functioning at work in and social life improved markedly. Interestingly, these effects were only significant after a 2 year period, which suggests that psychotherapy may take longer to integrate fully . Moreno, C., Laje, G., Blanco, C., Jiang, H., Schmidt, A. B., & Olfson, M. (2007). National trends in the outpatient diagnosis and treatment of bipolar disorder in youth. Archives of general psychiatry, 64, 1032-1039. Sajatovic, M., Valenstein, M., Blow, F., Ganoczy, D., & Ignacio, R. (2007). Treatment adherence with lithium and anticonvulsant medications among patients with bipolar disorder. Psychiatric Services, 58, 855-863. Vieta, E., & Colom, F. (2004). Psychological interventions in bipolar disorder: from wishful thinking to an evidence‐based approach. Acta Psychiatrica Scandinavica, 110, 34-38. Miklowitz, D. J. (2008). Adjunctive psychotherapy for bipolar disorder: state of the evidence. American Journal of Psychiatry, 165, 1408-1419. Miklowitz, D. J., & Scott, J. (2009). Psychosocial treatments for bipolar disorder: cost‐effectiveness, mediating mechanisms, and future directions. Bipolar disorders, 11, 110-122. Perlick, D. A., Miklowitz, D. J., Lopez, N., Chou, J., Kalvin, C., Adzhiashvili, V., & Aronson, A. (2010). Family‐focused treatment for caregivers of patients with bipolar disorder. Bipolar disorders, 12, 627-637. Martínez-Arán, A., Vieta, E., Reinares, M., Colom, F., Torrent, C., Sánchez-Moreno, J., … & Salamero, M. (2004). Cognitive function across manic or hypomanic, depressed, and euthymic states in bipolar disorder. American Journal of Psychiatry, 161, 262-270. Simoneau, T.L., Miklowitz, D.J., Richards, J.A., Saleem, R., & George, E.L. (1999). Bipolar disorder and family communication: effects of a psychoeducational treatment program. Journal of Abnormal Psychology, 108, 588–597. Miklowitz, D.J., George, E.L., Richards, J.A., Simoneau, T.L., & Suddath, R.L. (2003). A randomized study of family-focused psychoeducation and pharmacotherapy in the outpatient management of bipolar disorder. Arch Gen Psychiatry, 60, 904–912. Johnson, S. L. (2005). Life events in bipolar disorder: towards more specific models. Clinical psychology review, 25, 1008-1027. Zaretsky, A., Lancee, W., Miller, C., Harris, A., & Parikh, S. V. (2008). Is cognitive-behavioural therapy more effective than psychoeducation in bipolar disorder?. The Canadian journal of psychiatry, 53, 441-448. Phillips, M. L., Travis, M. J., Fagiolini, A., & Kupfer, D. J. (2008). Medication effects in neuroimaging studies of bipolar disorder. American Journal of Psychiatry, 165, 313-320. Vieta, E., Günther, O., Locklear, J., Ekman, M., Miltenburger, C., Chatterton, M. L., … & Paulsson, B. (2011). Effectiveness of psychotropic medications in the maintenance phase of bipolar disorder: a meta-analysis of randomized controlled trials. International Journal of Neuropsychopharmacology, 14, 1029-1049. Sidor, M. M., & MacQueen, G. M. (2011). Antidepressants for the acute treatment of bipolar depression: a systematic review and meta-analysis. The Journal of clinical psychiatry. Gitlin, M. (2016). Lithium side effects and toxicity: prevalence and management strategies. International journal of bipolar disorders, 4, 27. Dols, A., Sienaert, P., van Gerven, H., Schouws, S., Stevens, A., Kupka, R., & Stek, M. L. (2013). The prevalence and management of side effects of lithium and anticonvulsants as mood stabilizers in bipolar disorder from a clinical perspective: a review. International clinical psychopharmacology, 28, 287-296. Bergink, V., & Kushner, S. A. (2014). Lithium during pregnancy. Newport, D. J., Stowe, Z. N., Viguera, A. C., Calamaras, M. R., Juric, S., Knight, B., … & Baldessarini, R. J. (2008). Lamotrigine in bipolar disorder: efficacy during pregnancy. Bipolar disorders, 10, 432-436. Bowden, C. L., Asnis, G. M., Ginsberg, L. D., Bentley, B., Leadbetter, R., & White, R. (2004). Safety and tolerability of lamotrigine for bipolar disorder. Drug safety, 27, 173-184. Sajatovic, M., Valenstein, M., Blow, F. C., Ganoczy, D., & Ignacio, R. V. (2006). Treatment adherence with antipsychotic medications in bipolar disorder. Bipolar Disorders, 8, 232-241. Garno, J. L., Goldberg, J. F., Ramirez, P. M., & Ritzler, B. A. (2005). Impact of childhood abuse on the clinical course of bipolar disorder. The British Journal of Psychiatry, 186, 121-125. Otto, M. W., Perlman, C. A., Wernicke, R., Reese, H. E., Bauer, M. S., & Pollack, M. H. (2004). Posttraumatic stress disorder in patients with bipolar disorder: a review of prevalence, correlates, and treatment strategies. Bipolar Disorders, 6, 470-479.